Quality Products for Stage Lighting Professionals. Many items feature FREE shipping! 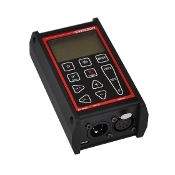 The Swisson XMT-120A is a DMX Measurement Tool/Tester - DMX Receiver, DMX Transmitter, Cable Tester, Channel Tracer, and More! The MQ40 is designed as a low cost DMX only console with a simplified user interface making it extremely easy to use - ideal for installations, clubs, schools, and small venues. Top Quality Professional 3 Pin DMX Cable - 25 Ft. Long with Neutrik connectors. 2 cables - $26.90 ea. 3 cables - $25.90 ea. 4 or more - $24.90 ea. At Stage Light Pro, we provide the best products and services for the lowest cost. We feature top quality professional products that will exceed the expectations of the most demanding stage lighting professionals. Whether it's purchasing a product from our online store, or using Stage Light Pro's design and event services, our customers appreciate our dedication to excellence.